Proprietary Name: Pyridostigmine What is the Proprietary Name? Non-Proprietary Name: Pyridostigmine Bromide Oral What is the Non-Proprietary Name? Pyridostigmine with NDC 70954-148 is a a human prescription drug product labeled by Novitium Pharma Llc. The generic name of Pyridostigmine is pyridostigmine bromide oral. The product's dosage form is solution and is administered via oral form. FDA Application Number: ANDA211694 What is the FDA Application Number? Pyridostigmine Bromide Oral Solution, USP is an orally active cholinesterase inhibitor. Chemically, pyridostigmine bromide is 3-hydroxy-1-methylpyridinium bromide dimethylcarbamate. Its structural formula is: Pyridostigmine Bromide Oral Solution, USP contains 60 mg pyridostigmine bromide per teaspoonful in a vehicle containing 5% alcohol, glycerin, lactic acid, sodium benzoate, sorbitol solution, sucrose, FD&C Red No. 40, FD&C Blue No. 1, raspberry flavor and water. 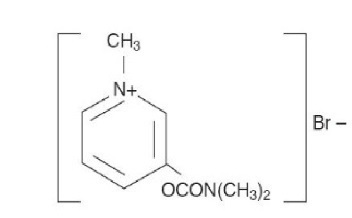 Pyridostigmine Bromide Oral Solution inhibits the destruction of acetylcholine by cholinesterase and thereby permits freer transmission of nerve impulses across the neuromuscular junction. 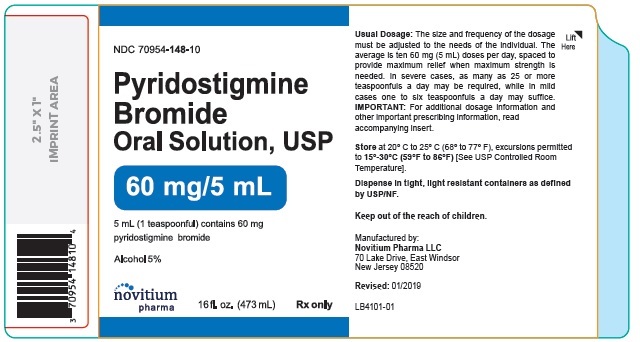 Pyridostigmine is an analog of neostigmine (Prostigmin™), but differs from it in certain clinically significant respects; for example, pyridostigmine is characterized by a longer duration of action and fewer gastrointestinal side effects. Pyridostigmine Bromide Oral Solution, USP is useful in the treatment of myasthenia gravis. Pyridostigmine Bromide Oral Solution is contraindicated in mechanical intestinal or urinary obstruction, and particular caution should be used in its administration to patients with bronchial asthma. Care should be observed in the use of atropine for counteracting side effects, as discussed below. The safety of Pyridostigmine Bromide Oral Solution during pregnancy or lactation in humans has not been established. Therefore, use of Pyridostigmine Bromide Oral Solution in women who may become pregnant requires weighing the drug's potential benefits against its possible hazards to mother and child. Pyridostigmine Bromide Oral Solution is available in the following form:Solution: raspberry-flavored, containing 60 mg pyridostigmine bromide per teaspoonful (5 mL). This form permits accurate dosage adjustment for children and "brittle" myasthenic patients who require fractions of 60 mg doses. It is more easily swallowed, especially in the morning, by patients with bulbar involvement.Dosage: The size and frequency of the dosage must be adjusted to the needs of the individual patient.Solution: The average dose is ten 5 mL teaspoonfuls daily, spaced to provide maximum relief when maximum strength is needed. In severe cases as many as 25 teaspoonfuls a day may be required, while in mild cases one to six teaspoonfuls a day may suffice.NOTE: For information on a diagnostic test for myasthenia gravis, and for the evaluation and stabilization of therapy, please see product literature on Tensilon (edrophonium chloride).